Like I said, I don’t really want to talk about horror right now after doing nothing but horror movies last month. Still, I can’t very well say nothing about Ash Vs. Evil Dead. I loved most of it. I laughed quite a bit (“You like my wooood?!“). I’m quite pleased that, once again, the entire reason Ash has to save the world is because of his own stupidity. 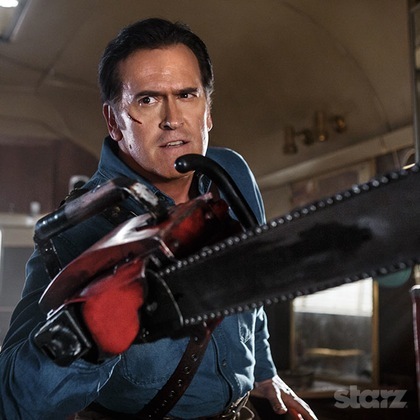 I’ve always preferred the visual tone of Evil Dead 2 over Army of Darkness, so I’m glad the showrunners appear to be going back to that. I’m tickled to death Lucy Lawless is in it because… well, it just makes so much sense to me. Otherwise, not all the gags worked for me and I don’t care too much about the subplot yet. I’ve seen and heard nothing but good things about Ash Vs. Evil Dead, but I couldn’t help but feel disappointed it’s only thirty minutes long. Sure, it’s good to be left wanting more, but I wanted so much more. Ultimately, though, I think that’s pretty high praise, right? I’ll have more to say later on. Next Post Introducing Monday Midnight Movies!